Home / #UBA4AfricanEntrepreneurs #UnitedBankforAfrica / Food / Lifestyle / Travel / SCINTILLATING EGUSI OR VEGETABLE WITH TRIMMIMNGS? 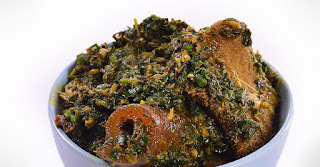 SCINTILLATING EGUSI OR VEGETABLE WITH TRIMMIMNGS? The joy of every individual passionate about traditional African soups is the process of washing it down with a swallow of choice. Whether you are eating it with Pounded yam, Eba, Amala or pairing with rice or yam for a different feel, we all love our Nigerian soup bowls. Beneath is a yummy bowl of egusi or as some other African tribes call it Melon seed garnished with Pomo, Cow leg, beef and greens and a Large bowl of Vegetable common in the Efik/Ibiibio regions of Nigeria as Edikainking and we are asking what would your rather pair with your choice of a swallow. Scintillating Egusi or Vegetable with trimmings?